Trek the coastal paths of the Howth Peninsula on this walking tour. Follow your experienced adventure guide along the cliffs and through the woodlands of this area, stopping at scenic overlooks and areas of spectacular natural beauty. Listen as your guide's commentary takes you back through the millennia in Irish history, including tales about the Vikings, Normans, Druids, and Celts. Dressed for trekking, meet your guide, a former coastguard member who knows the area intimately, near Howth Harbour and set off for your walking tour of Howth. Climb the hill up and out of the town, then continue through the ancient woodland. As you travel over the rustic trails and paths, listen to your guide's narrative about the history of Howth, including its legends and fables. Reach Aideens Grave, the magical portal tomb that is said to be a gateway to the underworld. Walk through the unusual jungle, imported to Ireland from the former Siam by Lord Howth centuries ago. In the woodland of the southern peninsula, trek through heathers and heath of Shielmartin Hill toward a dramatic coastal cliff. Stop for a rest at Red Rock Creek, then search out some coastal caves (tides permitted), where you can see some of the marine life that thrives below the water line. Climb up the well-known cliffside paths to Baily Green. Walk back down into town via the old tramlines, returning to the harbor. Thank you Zack and Bruno for an amazing day. Howth is spectacular, the view are amazing. Zack's local knowledge and enthusiasm made our trip one to remember. Would highly recommend. Comfortable walking boots are a must as you walk many miles over uneven ground. This was a fantastic tour, with a top guide. Top tip..... Howth is a very pleasant train tip from Dublin and the town is known for its excellent seafood, so well worth staying for dinner before heading home. What a fabulous way to see Howth. Our guide was Rob K. was knowledgable and experienced. We are glad we did this hike though some parts were challenging so be prepared. The views were worth it! You go through cliffs, the beach, wetlands, hills... you name it! Enjoy the challenge and make sure you are dressed properly. One of our favorite excursions in Ireland!! Thank you Rob for making the day a memorable one!! We really had a fabulous time on our tour of the Howth Peninsula! We so enjoyed hiking up the mountain through the woods, then across the cliffs overlooking the ocean! What a great day we had ! Excellent hiking experience. We enjoyed an energetic four hour hike through some great terrain. Our guide was excellent and made the journey even more enjoyable. Excellent way to see the beauty of Howth but be advised this is a challenging hike with difficult terrain at times and you need to be prepared. Bring water and wear long pants. The trails you will be traversing are sometimes overgrown and will shred your lower legs if not covered. You will navigate cliff faces and slippery rocks on the beach but don't let that deter you. This was my and my son's favorite excursion on our Ireland trip. Embrace the challenge, enjoy the beauty, and get ready for an intense workout. 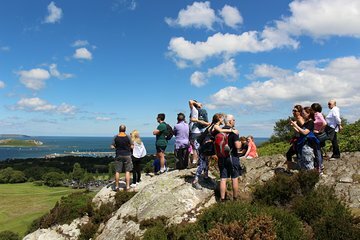 This hiking tour is good for a family with teenagers or people on their own who wish to explore Howth in an exciting hiking experience. Shane was an amazing guide!